What must a driver do when this sign is accompanied by a white stop line on the road? When you have passed the line. Only if there is traffic on the major road. No more than one car length past the line. 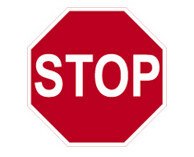 Explantion: When accompained by a STOP sign, the white stop line indicates the point at which you must stop your vehicle.